I feel as though I must first acknowledge those of you who anticipated my lack of perseverance in the continuation of this fantastical conglomeration of brain-pan ruminations (blog) *inclines head slightly in your direction* The fact that I myself am included in your number is of no import. Fear not, my faithful and ever nonexistent readers – I have not abandoned you, or my dear friends Huginn and Muninn. The position of Mother comes with a myriad of duties, responsibilities, obligations, and other miscellany – some fun, some not so very, but all just as necessary for the continuation of a happy existence as we know it. The month of June found me inundated with missions for the small one. Completion within the designated time frame was required, and I most unfortunately was left scrambling futilely in a doomed attempt to obtain bits of moments beyond the mere 24 that I have been given to fill a day. With June drawing to a close, and a decent night of rest behind and before me, I am now able to sit and reflect for a moment on what has recently passed in the wonderful world of Puffiness. First and foremost, lets jump and twirl and give it up for Teaglepuff, who is now most officially TWO years old! But, you know, none of the above applies, though its all true. Any mother worth her salt will tell you that Baby is the most important person in the world- bar none. . . she would do ANYTHING to see her smile. Including staying up until 2 am icing cupcakes with pawprints and cleaning dust from fanblades so her guests won’t run screaming the moment they enter her house (many thanks to my sister and mother for lending their helping hands). 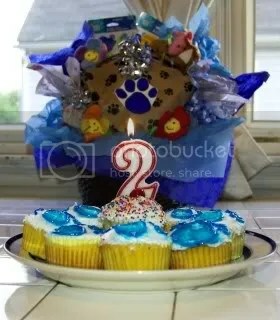 Some have criticized me on this matter, stating that my Puff would be happy with a single balloon and a cupcake, and she won’t remember it anyway, so any extra effort spent is, essentially, a waste. While both of these points are valid, my theory on the matter is that if a single balloon and a cupcake will please her, how much more so would 50 cupcakes and balloons from here to space? It matters not that her memory is a bit underdeveloped, that really isn’t the point here. 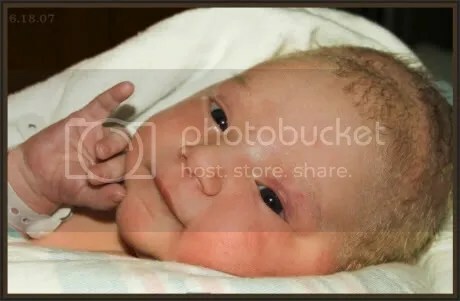 The point is not that she remembers, but that she had the happiest baby day that I can give to her to celebrate her grand entry into the world of 2. The Big Day fell on a Thursday, which would never do for a party. Nevertheless, it was her birthday, and as such I had to make it extra-special for her. When I punched out at 9:00 pm, my preparations began. I blew up 28 balloons, decorated the house with banners and streamers, and baked and iced cupcakes into the wee hours of the night, all with the objective of making her special day into a grandiose affair. 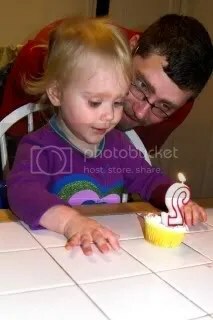 When she woke in the morning , we celebrated with cupcakes for breakfast and a special gift before Daddy left for work. 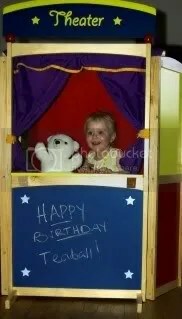 . .
One of the Big Things in Teagle’s world right now is puppets, so I conned my little sister (may she live forever) into gifting the girl with her very own puppet theater, while I snagged about a bazillion puppets to round the whole thing out. It was decided that we would give her these special tokens of our adoration on her actual birthday, rather than saving them for the party. After everyone got home from work, and my extra babies went home for the evening, my sister came over for a mini pizza fiesta. 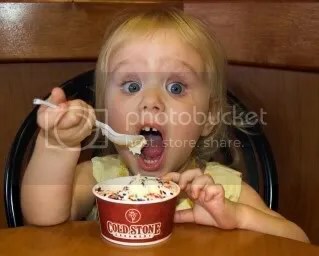 My mother joined us also, and while Husby stayed home to set up the puppet theater, we took Puff to Coldstone Creamery and she got her first-ever ice cream sundae (with rainbow sprinkles, of course)! Naturally, she loved it – even though she was less than a quarter through when it melted into a multi-colored milky brew. That didn’t dampen her sunny spirit one bit, why should it? She was The Birthday Girl – and she KNEW she was hot stuff! and as a grand finale presented her with the puppet theater – and the mass of puppets that went with it. Another roaring success, much to my delight. Who doesn’t love cupcakes and presents. . .and puppets? So. . . Yes. 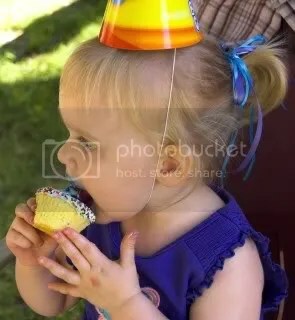 The Birthday Party – A grandiose event in my little Monster’s life. 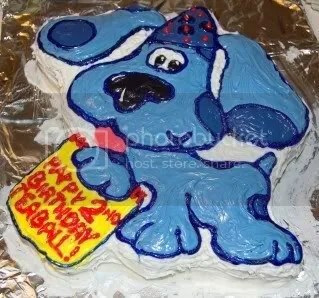 As you may have guessed the theme was Blue’s Clues. There is nothing in the world right now that Super Puff loves more than that little blue dog and her pals. Unfortunately, the people who run Nick Jr. are imbeciles. 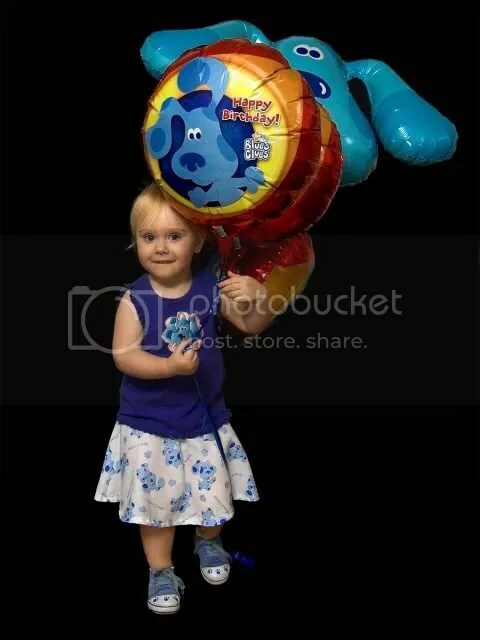 Some corporate bigwig made the executive decision to discontinue the entire line of Blue’s Clues merchandise – including party supplies – mere moments before MY little girl turned 2. After many sleepless nights spent cruising E-bay engaged in furious bidding battles with all of the other moms in the same boat, I finally managed to procure officially sanctioned Blue’s Clues tablecloths, plates, cups, hats, blow-outs, cake pan, balloons, stickers, goody-bags and party favors – along with a few choice gifts, that were required to please my teeny tiny dictator. 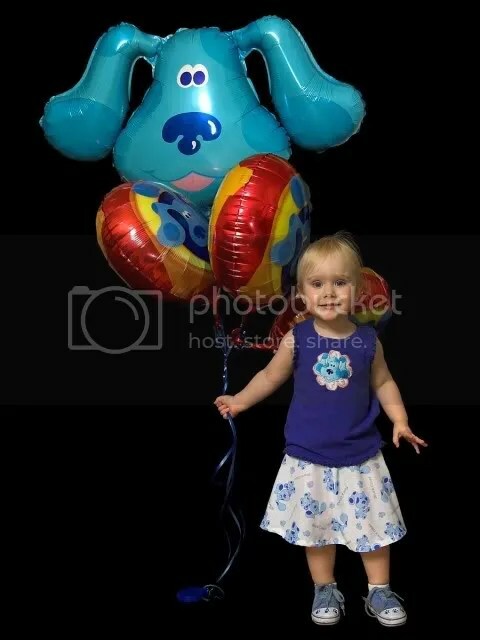 I even managed to get fabric with which to make her a super-special Blue’s Clues birthday outfit (pictured above). 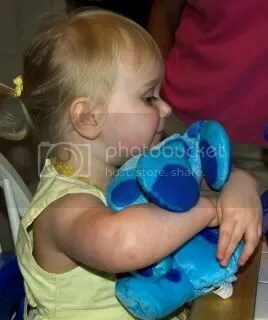 The Blue’s gifts included a hoard of books, a Blue puppet, plushie dolls of Blue, Magenta, and Periwinkle, a Blue/blanket lovie (which now resides in her crib), and a singing Blue’s Clues planet-naming game, among others. 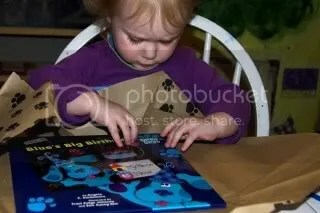 The Blue’s gift she liked best was a magnet playset that included Steve’s house, along with other prominent members of the Blue’s Clues gang. She hasn’t stopped playing with that thing since she opened it – and it was tough to wrest it from her minuscule fists when it came time for the next unwrapping. The gala was set for the Sunday after her birthday, and the day dawned clear and warm – a perfectly perfect day for a cookout. (Thank God and all of the people who prayed with me to make it so!) I can’t say much about the actual party, as I was too busy running around to really enjoy it, but by all accounts it was a huge success. 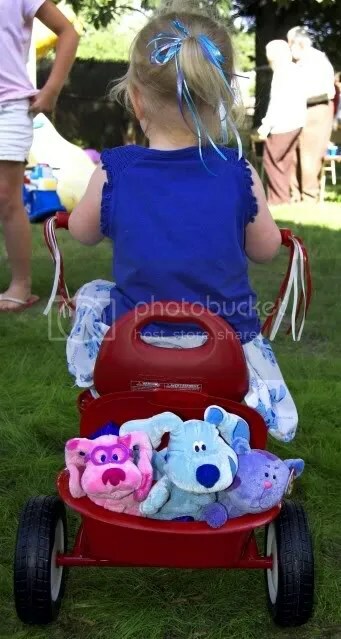 I could see how incredibly happy and excited T was to have all of her friends (including Blue, Magenta, Steve, and Periwinkle) there to celebrate the astounding achievement of turning 2. A few of the extra-special details, so you can feel like you were there *winks* : The goody bags were stuffed with star-shaped sunglasses, finger puppets, a Blue or Magenta figurine, mini bubbles, and a ring pop. Loads of fun for any toddler, for sure. I was only able to get a limited number of ‘official’ Blue’s Clues goody bags, so I made my own to fill in the gaps by painting a blue ‘clue’ on small white paper gift bags and covering it with glitter. The cupcakes were iced with blue ‘clues’ (pawprints) on them, as you’ve seen, and I managed to snag the Wilton Blue’s Clues cakepan (A bazillion thanks to my husband for his wonderful icing work on that one. I was absolutley terrified to touch it). Teagle was thrilled to discover all of the many ‘clues’ we had strewn randomly about the backyard and house. 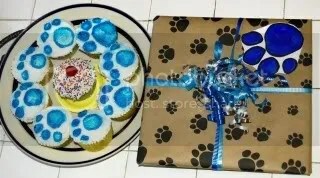 I had wrapped all of her Blue’s related gifts in brown paw-print paper and affixed a bright blue ‘clue’ to the front of each one. 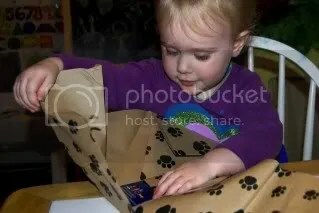 She figured out very quickly that all of the packages decorated in such a fashioned held some sort of wonderful Blue’s Clues thing within, and was very excited when she got to open one of them. We also had a bowl of kid-friendly goodies (mostly Gerber Graduate snacks) on the toddler picnic table within easy reach of mini fingers. The party was a backyard cookout, set for 3:00 – after T’s naptime. Most of the preparations were done while she was adamantly NOT sleeping (but locked in her crib anyway). The look on her face when she went outside and saw all the Blue’s Clues things and all of her friends and family was worth all the extra effort! 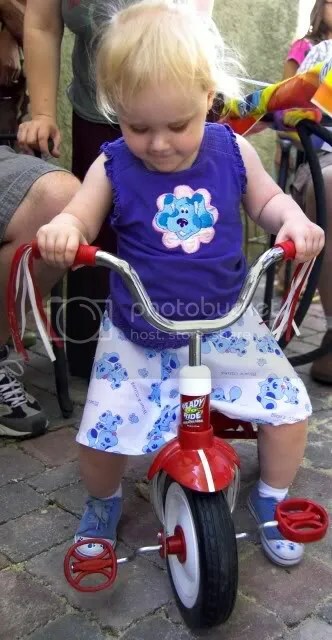 She was thrilled from her blue-ribboned ponytail to the toes of her clued-up shoes. She got loads of fabulous prizes from family and friends – and she actually sat there like a good little toddler and opened every last one. She got tons of Play-doh, coloring books, art supplies, and stickers of every sort. A dress-up doggie, (that she loves) a 3-d chalk set, assorted TinkerBell goodies (also a big hit), an automatic bubble-making machine (hooray for my old lungs), a wading pool, assorted clothing (including an awesome Blue’s Clues airbrushed shirt, play icecream for her kitchen set, a tricycle (one of the most-awesome gifts, in Puff’s opinion), and sooo much more. Spoiled rotten Super Puff. . .Thanks to everyone for making her day! She has come a long way since she got here such a short time ago. What is the twinkle star? *blushes* I love you too, Husby. Thanks for such kind words, that really made my day. aww so sweet!! Gotta love the pictures and, once again, I’m glad that your party was a success!! Congrats on everything you did, it was worth it! Even if I had to keep you company on the phone while you cleaned and re-cleaned your kitchen.